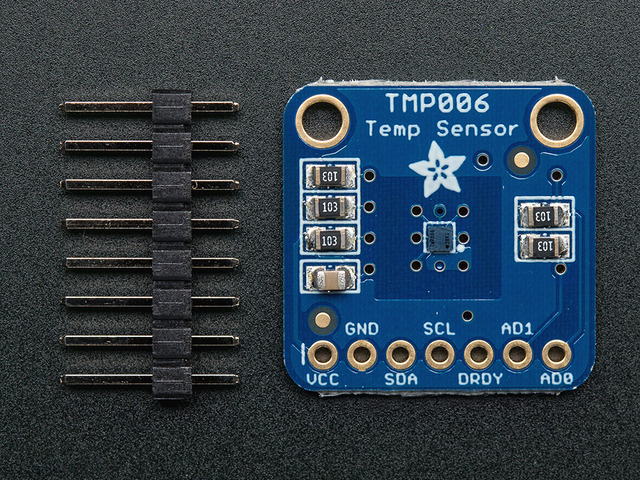 This sensor works best with objects that are good emitters of infrared radiation. The ideal emitter is a completely non-reflective surface or "black body". Black anodized aluminum or cast iron are pretty good emitters. Polished metal surfaces are very poor emitters, but can usually be turned into a good emitter with a bit of flat-black paint. A thermopile is essentially a whole lot of thermocouples aligned in parallel, but wired in series. Each thermocouple will generate a microvolt-level signal proportional to the temperature differential from the hot end to the cold end. And by wiring them in parallel, the output is the sum of all outputs of all of the thermocouples. By multiplying the output like this, very small temperature differences can be measured. This guide was first published on Mar 17, 2013. It was last updated on Mar 17, 2013. This page (Overview) was last updated on Apr 20, 2019.